It's even quicker next time you use that media as YoYotta remembers your source volumes and folders. The Source Browser is a great way to look at camera card and drive contents. 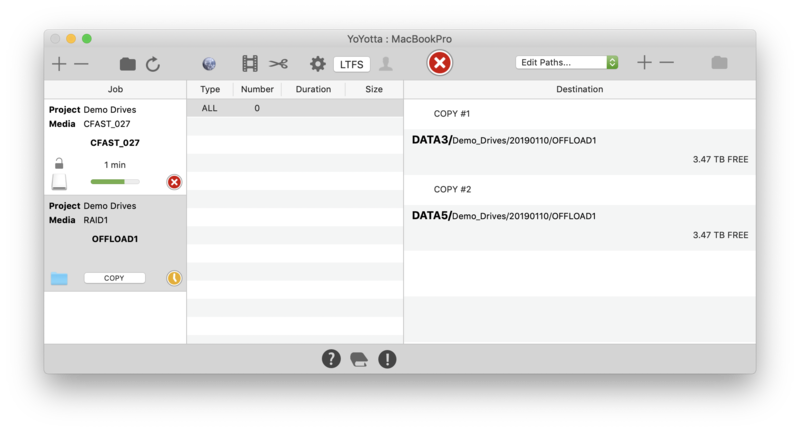 Use YoYotta to catalog your drives, volumes. 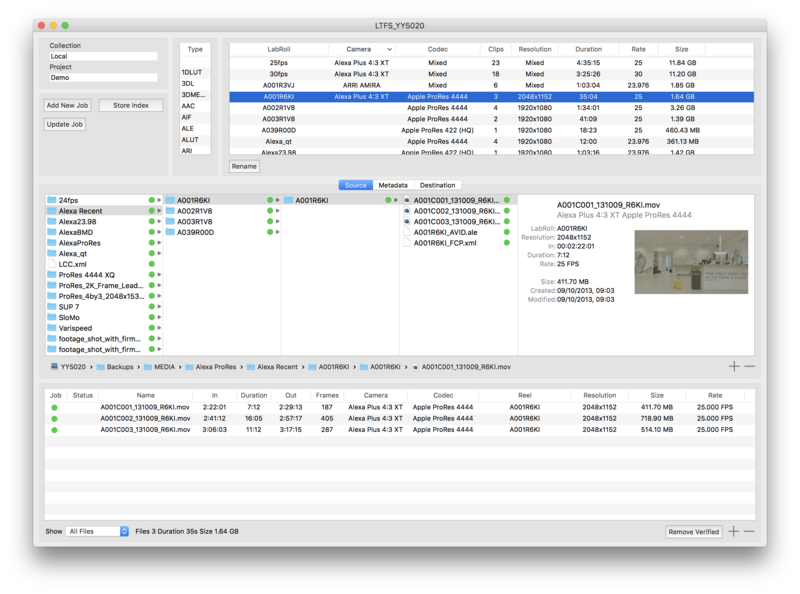 YoYotta LTFS and Automation enable indexing of LTFS tapes. 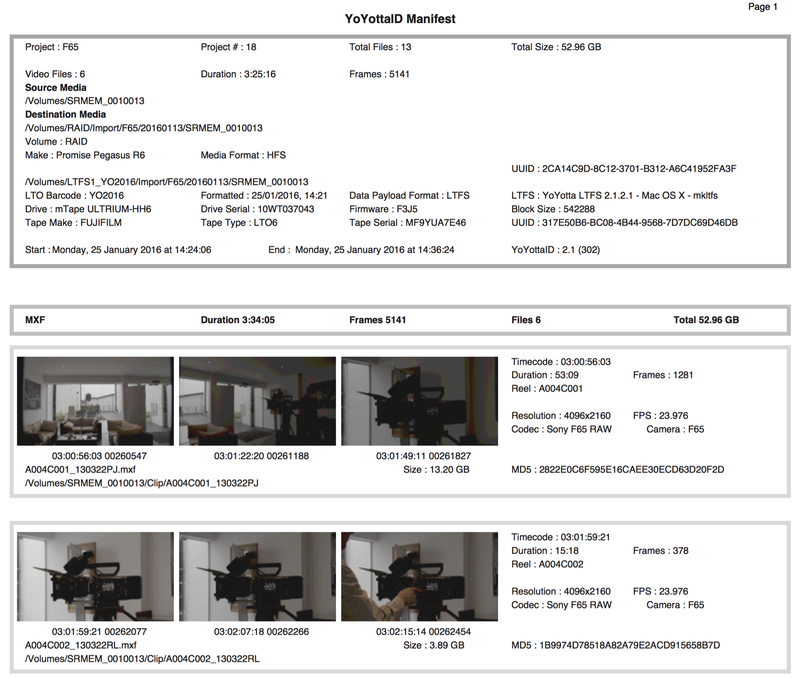 YoYotta stores full media metadata including codec, resolution, duration. It's quick to locate media and you can see where it's stored. Open a virtual folder showing all the media from your search in one place. Make PDF reports from searches, handy to give the producer a list of shoot durations for each media type. 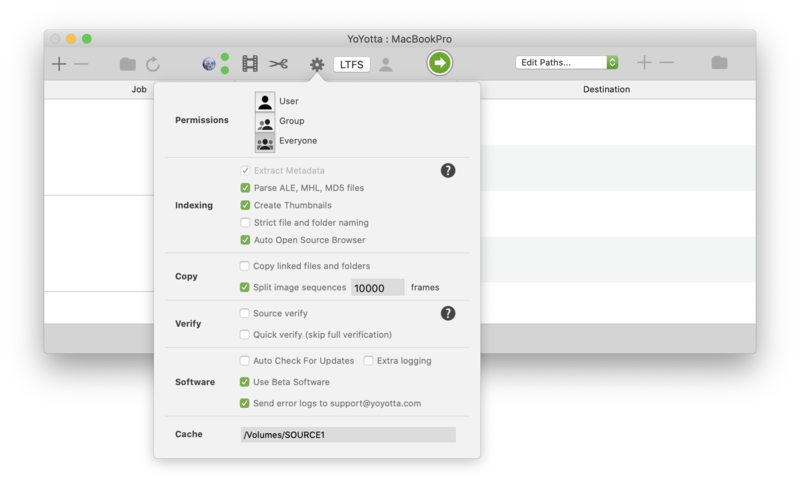 YoYotta's software runs on Apple Mac hardware. On a production use a Mac mini or Retina MacBook Pro. Use an Mac mini, iMac or MacPro in a cutting room or post house. Connect using USB-3 and Thunderbolt 3 to Media Readers and Thunderbolt to RAID storage. Receive email alerts, create PDF Reports, ensure file permissions are set correctly. As soon as camera cards or drives are connected they will appear on the left in the Media table. Source drives are mounted read-only preventing accidental erasure. YoYotta calculates both MD5 and xxHash checksum whilst copying and then verifies the copy using the checksum without any slowdown. See how long the job will take. When completed the green ticks show that all is correct and a PDF report will keep an audit of the files copied. Cards can be copied to multiple Backup destinations simultaneously. Copy multiple cards at once, or add them to a card for sequential copies. Limited only by the speed of connected storage. Stop an import and pickup later. Span large jobs across multiple volumes, disks and tapes. Start a large job that won't fit on a single volume. YoYotta will intelligently fill each volume without splitting shots. Keep adding volumes until the job is complete. The reports and the database will keep track of where the shots are archived. YoYotta LTFS will span the job across multiple tapes. YoYotta Automation makes it even easier using an LTO Tape Library to archive material without needing to manually swap tapes. 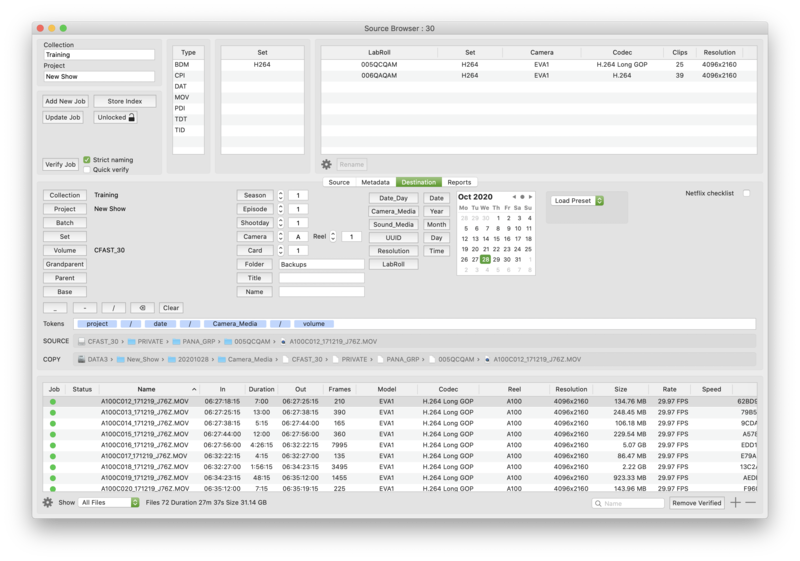 YoYotta can make consistent folders based on Project, Day, Date, Camera and Media names. This will make life easy throughout your project. v2 has more flexible tokens for folder names. Presets are automatically recalled for different camera types. YoYotta creates a PDF report and this can be automatically emailed to all team members without needing to setup any email software. The report contains the media checksums for future reference along with media codec, duration and resolution. This metadata is also in the database and stored as extended attributes in the file directory. The client brings their slow USB drive into your Post House. You need all the DPX and ARRIRAW files in your grading suite right now. The trouble is the files are all over the drive and there are loads of other file types that you don't need. When you connect a drive open the YoYotta Source Browser. 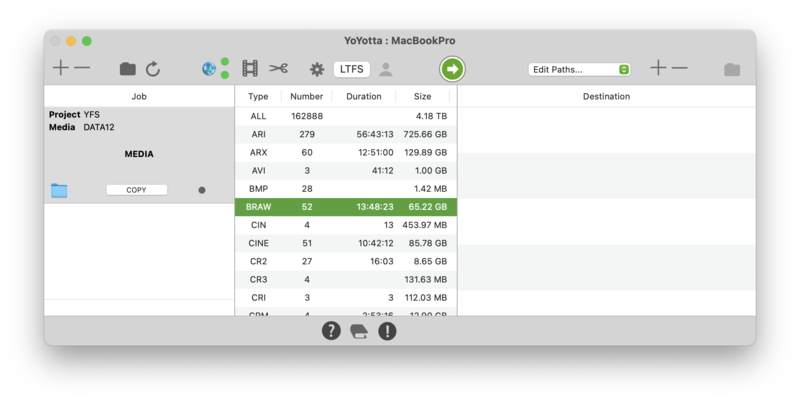 Select the file types you need and YoYotta will quickly transfer just those. You won't miss a folder hidden away on the drive. These files won't just be dumped into one folder, the original folder structure will be preserved on the destination. Also YoYotta knows about sidecar files, so if you select MOV you will also get THM, if you select R3D you will also get RMD. Here you can easily see that there are over 6 hours of MP4 files on the shuttle drive. 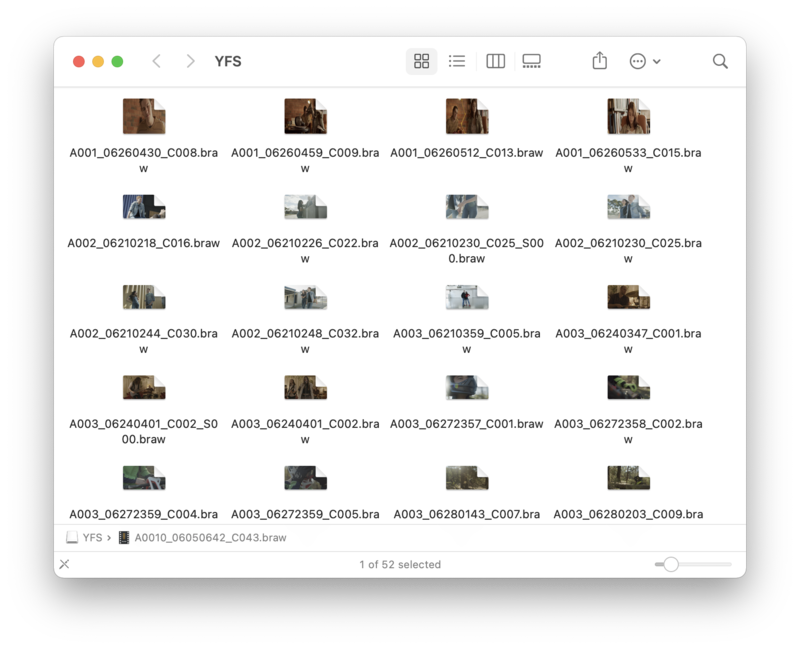 Select MP4 in the Type table and press the space key and then YFS will show you all those files in a single Finder window. YoYotta will create a virtual file system called YFS. Here we see all of the MP4 files on the shuttle drive virtualised into one convenient folder. They can be opened as normal. If you need to copy multiple high speed cards to the same RAID, then it's often quicker to process them sequentially rather than simultaneously. But this would mean waiting for each job to complete. YoYotta will offer to add the jobs into a queue. So you can walk away and let it get on, letting you know as each completes. 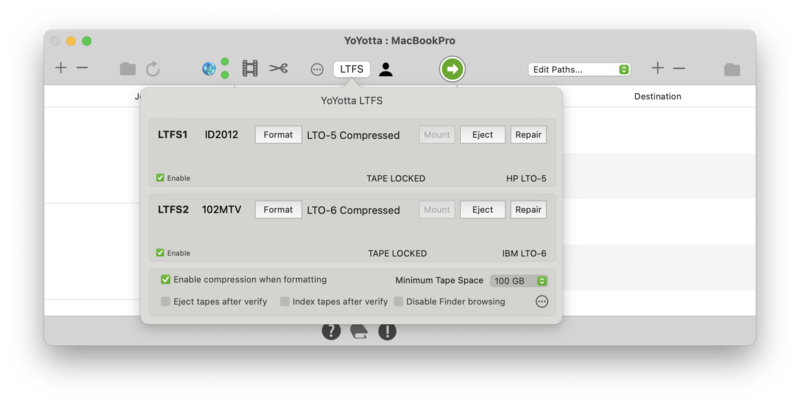 If you need to restore TAR LTO tapes or archive to LTO tape using LTFS then you need YoYotta LTFS or Automation. YoYotta LTFS create archives to one or two standalone LTO drives. Quickly create industry standard archives in the LTFS format on LTO-8, LTO-7, LTO-6 or LTO-5 tapes. YoYotta names, formats, mounts and repairs tape archives. YoYotta Automation adds control of up to four drives and an HPE, IBM, MagStor, Oracle SAS, Overland, Qualstar, Quantum, Spectra, StorageTek or Tandberg Tape Library. Both the LTFS and Automation options remember the health and contents of every tape created so later on you can search to find the location of shots. macOS 10.12 or newer is recommended.